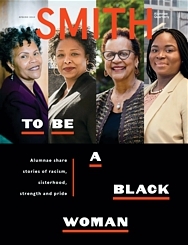 Home > Media > Alumnae Spotlight > Bravo! 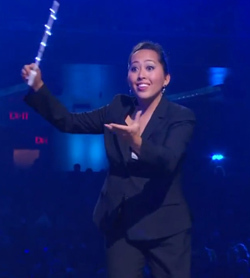 America’s Got Talent finalists: Arianne Abela ’08 conducts the 3 Penny Chorus and Orchestra at Radio City Music Hall. 3 Penny first caught the world’s attention last year when a video of the group performing Carly Rae Jepsen’s 2012 smash hit “Call Me Maybe” (put together just “for fun”) went viral, racking up more than two million hits. An invitation to perform on the Today show soon followed, and that led to an opportunity to audition for America’s Got Talent. Here she talks about 3 Penny Chorus and Orchestra, her musical mission and picking up a conductor’s baton for the first time at Smith. How and why did you form 3 Penny? What is in the future for 3 Penny Chorus and Orchestra? We want to continue to lift people’s spirits with our fun and original covers. We are all such great friends, so any chance we have to make music together is special. My hope is to eventually teach at the college level. I’m very excited about my doctoral work in choral conducting at the University of Michigan. They take one student each year, and I somehow lucked out!